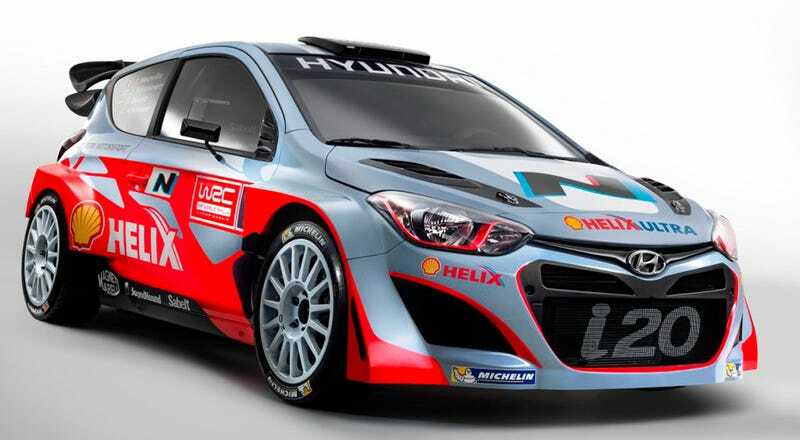 The 2014 WRC season is nearly upon us, which means it's time for the return of Oppositelock Fantasy WRC. The new season brings new cars, new drivers, new teams, and a new fantasy structure. First a quick look back at the 2013 season. McNewbie was our own Michèle Mouton in Fantasy WRC, shaming the boys and earning the title for highest points-per-rally average. Unfortunately also like Michèle she fell shy of earning the main title, though she certainly deserved it. Failing to make picks for Monte and Germany cost our lady motorhead and as a result she came up a scant nine points short of co-champions Hermann and Dusty Ventures. After 13 events and 632 points I most definitely did not foresee a tie coming. So, for 2014 there were a few changes that needed to be made, both to break any potential ties (though I would gladly co-rule with Hermann again) and to confuse McNewbie for teh lulz (she confuses easy). So throw out your Old Holy Rulebooks of Antioch and take note. Here are thine rules for 2014 (for a simplified "cliff's notes" version skip down to the text alongside the photo below). •Once again thou shalt not place two drivers from a single team upon thy roster, except for thine special stage. •Thine points shall be the sum of the points earned by each of thy drivers (before adding in special stage points). If thy #2 driver finishes third, thou earns third place points (15) for that driver. If thy #4 driver finishes ninth, thou earns ninth place points (2). If thy #1 driver rolls and earns zero, thou should not have chosen Kris Meeke. •Thine special stage shall now award points to the five fastest drivers, as good King Arthur always desired. Thy points shall be merited as follows: 1st-6pts, 2nd-4pts, 3rd-3pts, 4th-2pts, 5th-1pts. This is to help prevent another tie in the results. •McNewbie, Lady of the 1000 Lakes, requested bonus points for choosing the winning driver, so she shalt have them. If the first driver on thy roster wins the rally thou shalt be rewarded with three points of bonus. Orlove, thou may ignorest this bit. •If thou managest to put thy drivers on thy sacred roster in the order they finish thou art clearly a witch. However, as it has been decreed by the supreme coven that burning witches is no longer "politically correct" thou shalt instead be rewarded with ten bonus points. This only applies if all five of your drivers score points. •Fantasy previews shalt be posted the Monday before the rally six hours after the noon in Briton, the time zone of our Lord. That's 1 PM U.S. Eastern to you philistines and heathens. •Points shall be posted to the spreadsheet and a review written by Thor's Day after the rally, this is to ensure Sir Dusty of the Most Holy Fantasy Rally Championship can get his required rest. •LASTLY, BUT IN NO WAY LEASTLY, there shalt be only one championship this year. The average points title is no more, as it failed to cross the bridge of death. Points in the one and only true championship shalt still be cumulative, but only thy nine best events shall be counted. This means if thou forgetest to make picks for an event, or if the Killer Rabbit of Acropolis gnaws the tires off thy drivers' cars, thou needest not hurl thyself in the path of the nearest passing carriage. Thou still havest a chance at acquiring the grrrrrrail. •Also, if there be-ist a tie at the end of the season, it shall be broken in favor of the knight with the most event wins. Failing that it shall be in favor of the knight with the most podiums. Failing that it shall be in favor of the knight who first produces the phone number of the cute girl at the other end of the tavern. Right, yes. Here's a simplified version. Before each rally you pick five drivers. No two drivers can be from the same team. You also pick a driver for the power stage (final stage of the rally). He can be absolutely anyone, including one of the five drivers you already picked. Put your five drivers in the order you think they'll finish. You will receive the number of championship points your driver earns in the rally. Update 1/13/14: Two quick additional rules. 1) If you don't get your picks in before the start of the rally don't freak out, you can still make picks, though to make it fair you'll be penalized 5 points for missing the first stage and 2 points for every subsequent stage run before you submitted your picks. 2) If, after you have made your picks but before the start of the rally something happens to one of your drivers (injury, penalty, alien abduction, suddenly realizes he's meant to be a baptist minister) you can adjust the position of or replace said driver. Anyway, here are the driver rosters for the main WRC teams for 2014, along with the typical confusing driver performance statistics spreadsheet. For the sake of concise preview posts and me being a lazy there will be fewer stats in the previews themselves, so if you actually use the numbers to make your picks you'll need to refer to the spreadsheets.